Learning to prepare perfect sticky rice and create artful sushi rolls can be a fun dinner party with friends. You'll get plenty of practice making four different rolls in this class, and you'll get the recipe for two tasty sauces. 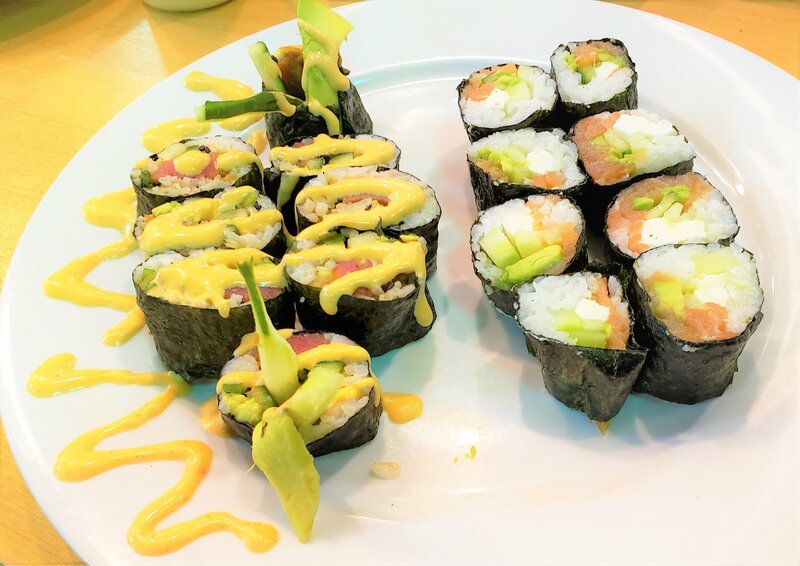 This class will teach you the fundamentals of creating delicious and healthy Sushi. We'll also practice a bit of plating and presentation. You'll receive your own bamboo sushi mat to take home!! We hope you roll... eat... and repeat at home. Must be 18 years old to attend this class. Pregnant women or persons with weakened immune systems should not take this class, as there is a risk with consuming raw seafood. 7-Day cancellation policy. Call for Same Day Scheduling. Hello there learning kitchen students! I’m chef Patrick Aylward. I started working in the food industry as a young boy at the age of 14. After going to college for marketing and economics, I dropped out to become a chef. I started working for Jeff Ruby’s Precinct, shortly after moved to Milwaukee, Wisconsin working for bakeries, Italian and new American restaurants. Upon moving back to Cincinnati, I worked at Salazar where I learned a respect for food and vegetables that will be instilled in me for the rest of my life. I then worked for Panino a local salumerie and learned a respect for animals that will also last a lifetime. I currently work for Tano Bistro in Loveland, teaching at The Learning Kitchen, and run a small private dining/catering business. I love to cook peasant foods, things with a short ingredient list, that require care, and attention to yield a scrumptious result. I love being outdoors, spending time with loved ones, and showing the local restaurant community support. I aim to empower people who step through our doors of the learning kitchen. Picking up a knife and turning the heat on can be very intimidating. I hope that through my experience and excitement we can empower you to cook new things, buy new ingredients, and explore the limits of your kitchen after taking a class with us. Cheers! I hope to see you soon. Our recipes use common ingredients that may or may not be specified in the menu, including various fruits and vegetables, nuts, meats, spices, wheat flours, etc. If you have a food allergy or dietary restriction we should be aware of, please call or email before attending the class. We may or may not be able to accommodate.